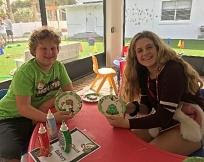 On December 15, 2018 right before the holiday season, Key Club members Jenna M., Ally J., and Caden E. joined Morgan&apos;s Project to host a Christmas party for the kids. Many of the kids have special needs such as autism, anxiety, or physical disabilities. During the event the children decorated cookies, made marshmallow sculptures, and sang Christmas carols. The event put everyone in the Christmas spirit.